Ornate wrasse larvae (Halichoeres ornatissimus) were raised from captive-spawned eggs at 77-79F on cultured ciliates, wild and cultured copepods, artemia and micro pellets. First record of Ornate wrasse culture. Wrasses are a large and diverse group of mostly brightly colored, carnivorous reef fishes, comprising 82 genera and over 600 species. They occur in tropical to semi-temperate waters worldwide but are mainly found on shallow coral reefs. They are typically small fish, most of them less than 12 in/30 cm long, although the largest, the humphead wrasse, can measure up to 6 ft/2 m. Most wrasses are haremic, sequential hermaphrodites and have multiple juvenile and adult color phases. They typically produce eggs that are pelagic, spherical, and small, although a few North Atlantic species produce demersal eggs. Female Ornate Wrasse (Halichoeres ornatissimus)(Hawaii). Numerous large wrasse species (such as the tautog, humphead wrasse, and hogfish) are heavily fished for their delicate meat, while brightly colored smaller species are popular among aquarists. Several temperate wrasse species (goldsinny, rock cook, corkwing, ballan wrasse) are aquacultured as cleaner fish to combat sea-lice infestation in salmon farms. The Humphead Wrasse (Cheilinus undulates), the Bluestreak Cleaner Wrasse (Labroides dimidiatus), the Hawaiian Cleaner Wrasse (Labroides phthirophagus), the Kyusen Wrasse (Halichoeres poecilopterus) and Hoeven’s Wrasse (Halichoeres melanurus) have been cultured experimentally. Farming most tropical wrasses is difficult, due in a large part to the small and delicate larvae at first feeding. Ornate Wrasse (Halichoeres ornatissimus) juveniles were raised from hatchery spawned eggs in July 2015. This small (up to 6 in/15 cm), colorful wrasse species resides on mostly shallow reefs in Hawaii and the tropical Pacific, often feeding on small benthic mollusks and crustaceans. A large adult H. ornatissimus male and two adult females were collected in waters off Oahu, Hawaii. The harem was conditioned at the RCT hatchery for just over 3 weeks before they spawned. The fish reproduced daily near 4 pm. Egg quality was initially poor but gradually improved following an increase in broodstock feedings. H. ornatissimus larvae were brought through first feeding on a mix of Parvocalanus sp. nauplii and ciliates (primarily Strombidium sp.) and through flexion on wild and cultured copepods. Post-flexion H. ornatissimus larvae survived well on live adult copepods and Artemia and pellets before settlement. H. ornatissimus eggs are spherical, clear, contain a single oil globule, and measure 0.65 mm in diameter. The larvae are small (1.6 mm TL/Total Length) and primitive at hatching, begin to feed 3 dph (days post hatching) near 2.6 mm TL and pass through flexion near 20 dph at 4.6 mm TL. Halichoeres larvae bury in sand during juvenile transformation. H. ornatissimus larvae first disappeared in the sand near 47 dph (10 mm TL), emerging 6–7 days later as colorful juveniles. This species was difficult to rear largely because of its delicate and small-mouthed early-stage larvae. Post-flexion H. ornatissimus larvae were less fragile. The approximately 50-dph larval period of H. ornatissimus was longer than the two previously raised Halichoeres species; Halichoeres poecilopterus settled by 33 dph (Kimura and Kiriyama, 1993), and Halichoeres melanurus settled by 22 dph (Rising Tide Conservation Initiative). Longer planktonic larval durations (ranging from 39 to 56 days) have also been reported for wild H. ornatissimus larvae (Victor, 1986) so it’s likely that the H. ornatissimus larval phase will not be shortened significantly by improving the culture method. Despite this, juvenile H. ornatissimus appear ideally suited for aquaculture. They are attractive, hardy, fast growing, and not aggressive toward each other at higher stocking densities. Baensch, F. 2016. Exploring aquarium wrasse aquaculture and breeding success with the Ornate Wrasse. CORAL 13 (6): 38–50. PDF available upon request. Kimura, S. and T. Kiriyama. 1993. 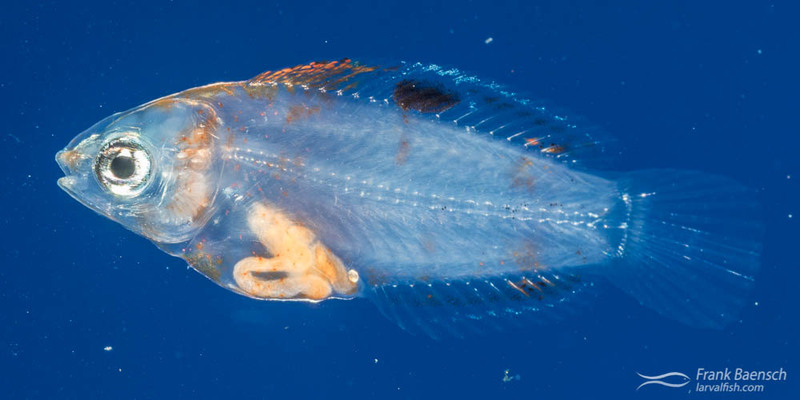 Development of eggs, larvae and juveniles of the labrid fish, Halichoeres poecilopterus, reared in the laboratory. Jpn J Ichthyol 39 (4): 371–77.